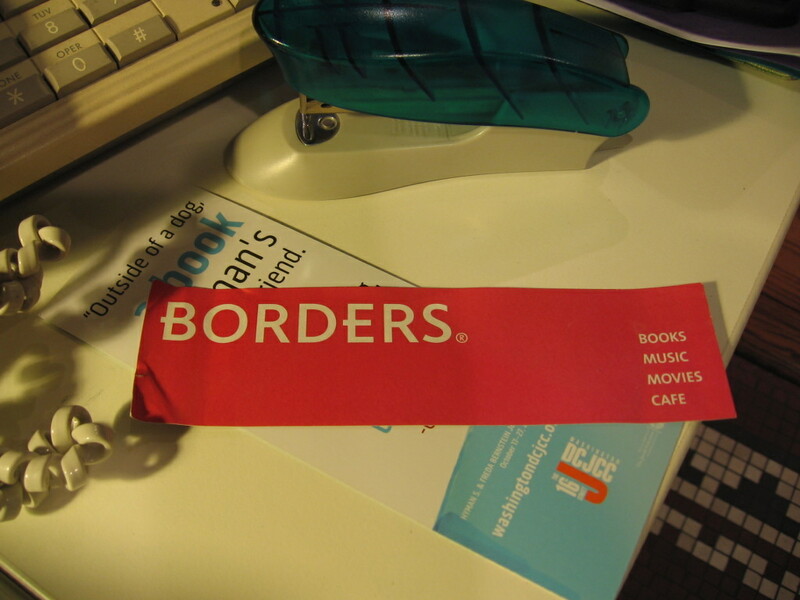 I’ve been cleaning up my desk (a highly overdue task) and came across this Borders bookmark, and as I was about to toss it in the recycling bin, I stopped myself, because I realized that, “Wait a minute, this is historic now. There aren’t any more coming from where this came from.” Namely, most likely, the Borders bookstore that was three blocks from where I live. The Borders bookstore chain ruled the bookstore landscape for a while but went bankrupt last year. I must say, though, that I wasn’t that sad when the local one closed its doors. In the beginning, I loved that store. It had a nice café on the second floor and on my Fridays off, I could stop there after dropping the kids off at school, have a cup of coffee, maybe a brownie, and browse books. But then they changed their opening hours to 10:00 a.m. Gone was that treat. Then it slowly became the local hangout for teenagers. One time I went it to look for a travel guide and couldn’t even enter the nook with the travel books as I found myself facing five teenagers, their backpacks and down jackets all over the place. Having to excuse myself for wanting to look for a book in a bookstore felt rather awkward, and it was equally unpleasant to have the store manager busy shoo-shooing those who clearly weren’t there to buy something out of the store. An unpleasant shopping experience makes you not go to a store anymore. This might just be the local experience and have little to do with the overall demise of Borders but it also shows how, with the best intentions, a store can fail. Luckily, our local mainstays, Powells, 57th Street Books, and the Seminary Co-op bookstores are still around, and interestingly, they are of the independent kind that supposedly is endangered. They are, however, much farther from where I live, and so I’ve been thinking about what it means not to have a bookstore around the corner. A friend recently remarked how pathetic it was that we don’t have a big bookstore downtown Chicago anymore, but then again, we didn’t before the big Borders moved in, so we shall live. For me it just means life is back to before Borders. There is amazon, and amazon to me is the real advantage in 21st Century book life. 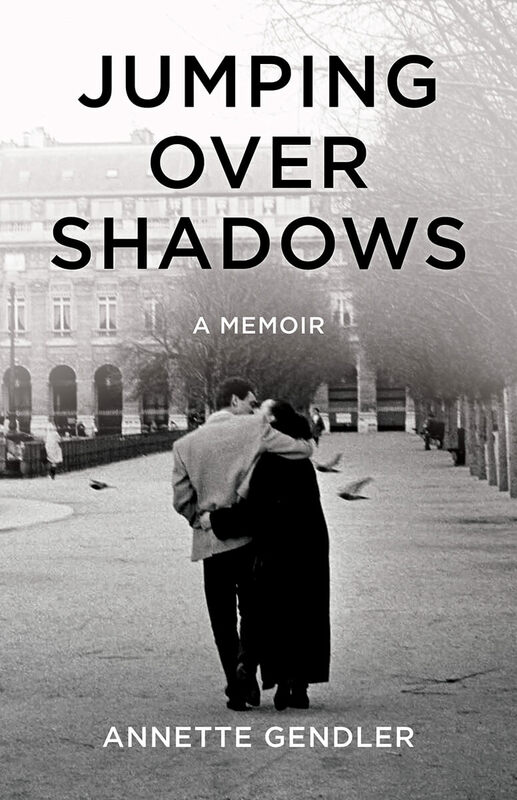 I love researching and buying books at amazon, and I use their “save for later” cart function as my virtual “to read” list. Plus I can buy books in France or Germany if I want to. But I also love stopping at my favorite bookstore, which these days is the Barnes & Noble in Valparaiso, Indiana. It’s got that big store feel, a great selection of nonfiction and memoir, and I always get my favorite British magazine there. And there is something to browsing in a bookstore, just like there is something to reading an actual newspaper. Looking through shelves or turning over pages makes you notice things you otherwise wouldn’t, and that a Search function wouldn’t find, because you don’t even know you’re looking for it. So most often, the whole family leaves that store with more than we were looking for. I agree! I lost a Barnes & Noble and a Borders in six months… but just this weekend found a great independent only 10 miles away! There is hope! I still remember the Kroch's and Brentano's Bookstore in Chicago, which was the leader for many decades. Gone now for the past 17 years or so. As much as I enjoy browsing in a large bookstore, the small local ones are very appealing. 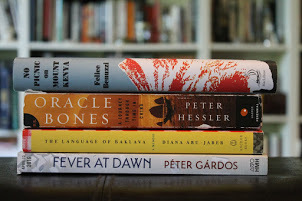 Lawrence, KS has The Raven–for mystery lovers and one in the Kansas City area is Rainy Day Books. Lovely names with much to draw people in. I don't have a bookstore right around the corner but one that's maybe 15-20 minutes away. Its full of recycled books but she can get the newer books by order if one wants. I love the feel of that store, the homeliness, and of course the walls of books. But I don't go in there much because of the owner. She tends to be a little put-offish. She is very opinionated about e-books and the digital era. She feels it will put her out of business. I asked if she had a website of her own, she said no. That her customers were the "older" generation who didn't use computers. I know plenty who do! It's sad, but I'm pretty sure she's correct that she'll eventually go out of business. Not because of the Amazon's in the world, but because she isn't willing to incorporate the changes of technology into her business structure. She could very well maintain a great little shop to cater to her "older" customers as she puts it, but she could probably get a website and manage her inventory online as well. By doing that, she might be able to reach a few of the younger generation and increase sales. I'm selling my self published book at small independent bookstores and last year two of them closed so I had to go pick up the copies that didn't sell. That was depressing. Every time the mail comes now, I'm afraid the book stores that are open will be notifying me they're closing, too. Oh, this sounds like such a fun read! Thanks for adding another to my TBR list…and one that could potentially be a fun read aloud for a class!